It’s time for another movie review presented by our good friends over at FatCats Gilbert on the southwest corner of Greenfield and Baseline! FatCats Gilbert is the best place to see all of the latest box office hits like Venom, A Star is Born, and First Man! To see all showtimes and to purchase tickets, you can click right HERE! If you told me at the beginning of the year that I could only see three movies in 2018, First Man probably would have been one of them. I’m a huge fan of Damien Chazelle. Whiplash was my favorite film of 2014, and La La Land was my favorite film of 2016, so I may have had some expectations going into First Man. I’m also a massive Ryan Gosling fan. It isn’t just his recent success that gets me. It’s everything. I shamelessly love The Notebook, and Half Nelson still stands as one of my favorites of his. Also, Fracture is one of the most underrated thrillers of the 2000s. I will say that he hit his stride in the 2000s with Blue Valentine, Drive, and The Place Beyond the Pines. He has had an unbelievable decade, and, without anything securely on his plate for 2019, it’s only fitting that he caps it off with the third film from the youngest winner of the Best Director Oscar in history! 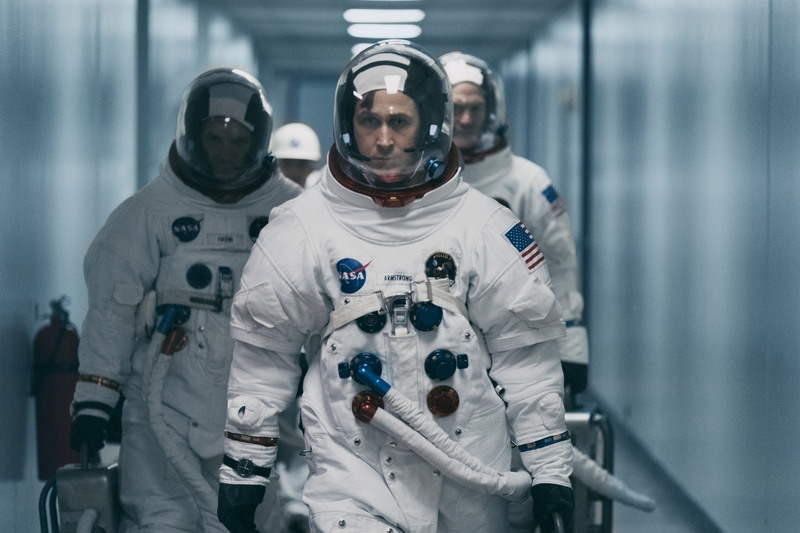 First Man is directed by Damien Chazelle and stars Ryan Gosling as Neil Armstrong, the first man to walk on the Moon in the midst of an international space race. The Eagle landed with Armstrong at the helm alongside two astronauts who would go down in history, but there is much more than interplanetary travel to this American hero and pioneer of outer space. Again, I’m a big fan of Damien Chazelle. He only had to make two movies for me to consider him one of the best working directors today, and, in case he hadn’t before, I absolutely think that he cements himself as one of the best with First Man. This isn’t a perfect movie, and I would definitely put it at the bottom of his directorial filmography, but he makes enough great choices technically and artistically for First Man to work. What I think is unbelievably impressive is the way he was able to make the film feel so airtight technically, yet so unpolished. To be completely honest, I’m not exactly sure what Chazelle shot this film on. I do believe that he used IMAX cameras to shoot the sequences on the Moon, which are mind-blowing, but the rest of the film feels so gritty and imperfect, perfectly paralleling the life of Neil Armstrong. That’s where this movie hooked me. The Moon landing is a larger-than-life achievement by NASA, America, and everyone involved in the entire process. It’s historic, and it’s an event that will likely be in textbooks and encyclopedias for the rest of time. Fortunately, Damien Chazelle chose to focus on Neil Armstrong as a person as compared to Neil Armstrong, the crew leader of Apollo 11. Yes, being the commander of Apollo 11 is his biggest career achievement, but there are layers beyond that pertaining to his family. Chazelle showcases those layers beautifully. He hammers home the idea of having an astronaut as the head of a household. Space travel is still not fail-safe, but it was even less safe in the 1960s during Armstrong’s time. We actually see Armstrong being launched up into the sky in glorified cement trucks, and it feels dangerous. This movie takes into account the personal and familial struggle that comes with being an astronaut. It also deals with the theme of sacrifice. I love that it was able to address sacrifice in contention with the endgame. Was it worth it to lose the lives of multiple astronauts to put a man on the Moon? Was it worth the taxpayer money to send someone to the Moon while arguments could be made that the money could have gone somewhere else? First Man is a very patriotic movie, but it never feels like it’s putting this event on a pedestal until Armstrong is actually on the Moon. It boils these massive stakes and consequences down to their cores, and I think that was a great move by Chazelle. Ryan Gosling and Claire Foy are also both spectacular in the film. Often times it takes much more control and maturity as an actor to remain reserved, but Gosling and Foy both hold back and give very subtle, consistent performances. I can’t tell you if Gosling will be nominated for an Oscar for this role, but if he is, I don’t know which scene they would show prior to announcing the winner. There isn’t a moment in which Gosling captures the spotlight. He’s very subdued, straightforward, and calculated, and I think that it worked. Though Claire Foy does have a moment that boils over, she gives a similar performance, and I thought she did a great job complementing Gosling’s performance and bringing his character to life. I can’t say enough about First Man from a technical perspective. It’s beautifully edited and sharply directed. Chazelle almost exclusively uses handheld shots and still frames. He breaks filmmaking down to its core, and I think that the film feels much more personal because of it. Often times we talk about shaky-cam in action sequences. Chazelle uses shaky-cam in some of the launching scenes, and it absolutely works. It’s not the clearest way to present the scene, but I feel that it’s the most accurate. I felt like I was in the ship with Armstrong, and it wasn’t a good feeling. As if this is surprising to anyone, Chazelle also used sound and music brilliantly. There are two reasons that this movie should be seen in theaters. First, the Moon sequence is amazing. It’s breathtakingly beautiful and revelatory for a human in Armstrong’s situation. It’s handled about as perfectly as it could have been. 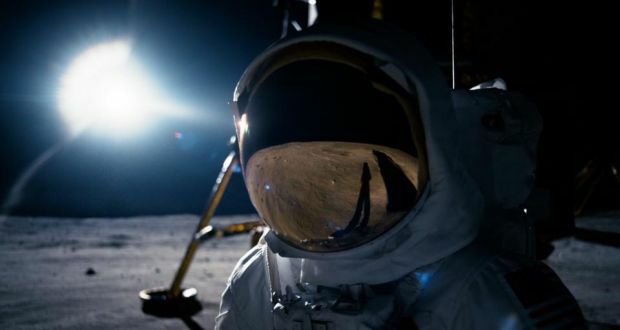 Second, the sound design makes First Man a must for the senses. Justin Hurwitz, Oscar-winner and Chazelle’s friend from college, composes a great score that Chazelle puts to use brilliantly. Oddly enough, I love that this movie is personal, but I don’t think that it’s quite personal enough. It may just be the nature of Neil Armstrong, but I never felt myself fully invested in him as a person. 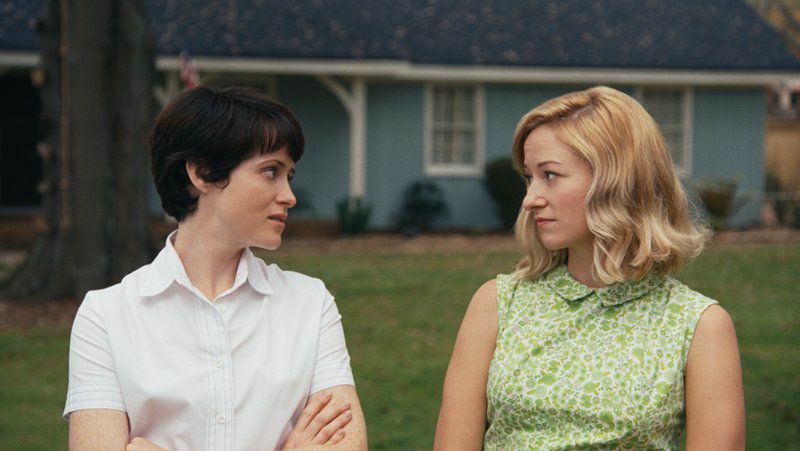 He’s interesting, and Damien Chazelle does a great job of showing what space travel does to the friends and families of 1960s astronauts, but it never made me feel like I was one with the movie from an emotional standpoint. I mentioned that the film completely engrossed my senses. I stand by that, but it never completely engrossed me emotionally. As much as I tried to connect myself with the story, I was never able to bridge the gap between my brain and the movie. The beautiful thing about a movie that hits all the right emotional tones is that it becomes a joint experience. Members of the audience get to interact and share a special bond with each other, and they get to share a special bond with the film. I never felt that bond with the film. I understand that Armstrong was a certain way in real life, but as a retelling of this story, it’s still a narrative film that is tasked with the job of emotionally resonating with me, and it just didn’t hit me. Overall, I’d absolutely suggest seeing First Man. Damien Chazelle did a great job making this story feel personal to Neil Armstrong and showcasing how space exploration affects members of NASA, their families, and the rest of the citizens of the United States. It even shows how the space race affected members of other countries. I felt the importance of getting to the moon, and I felt the importance for Armstrong as a character because of the way that achievement paralleled his personal life. Chazelle made all of the right decisions when it came to how he was going to tell this story. Technically, the film is brilliant. Chazelle uses a lot of handheld shots to make the audience feel closer to the film and put us closer to the actual events. He also has an excellent sense of sound, and though it is chaotic at times, so were the lives of everyone involved in Project Gemini and the Apollo missions. Strangely, this is such a personal movie, but it never fully invested me. It was never able to erase the gap between the screen and me, which is why I can’t say that First Man reached the almost unreachable peak of Whiplash and La La Land. It is still a great look at Armstrong with great performances and great technical and artistic direction. I’m going to give First Man an 8.3/10. Will you be seeing First Man? Comment down in the comment section and let me know! As always, thank you, and keep listening to 88.7 The Pulse!